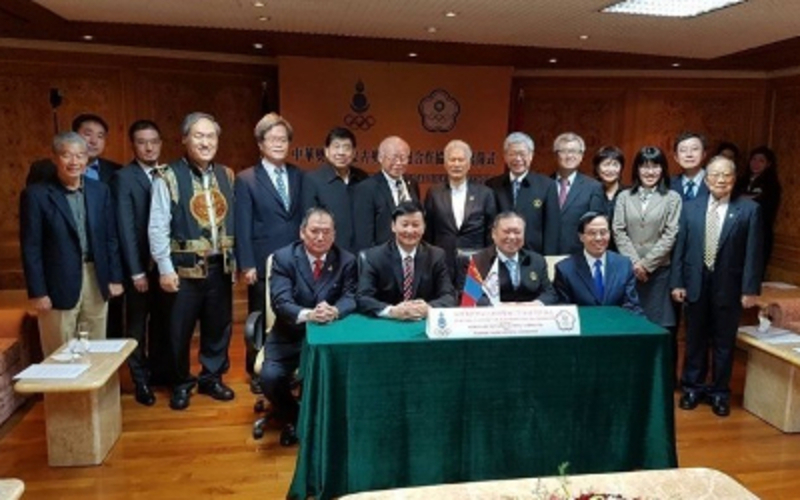 AKIPRESS.COM - The Presidents of the Mongolian National Olympic Committee (MNOC) and the Chinese Taipei Olympic Committee (CTOC) have signed a bilateral co-operation agreement in the capital of Taiwan. Also in attendance were members of the Ministry of Foreign Affairs of Mongolia and the Mongolian Trade and Economic Representative Office in Taipei, reports news.mn. Under the agreement, both Committees will exchange athletes, coaches and specialists and organize joint training. The MNOC started cooperating with Taipei in 1994; Mongolian boxing and freestyle wrestling coaches have worked extensively in Taiwan. Mongolia won two medals at the Rio 2016 Olympic Games in August, while "Chinese Taipei" claimed three, including one gold. Judoka D.Sumya won silver for Mongolia in the women’s 57 kilograms category before compatriot D.Otgondalai secured bronze in men’s lightweight boxing. "Chinese Taipei" is due to host the 2017 Summer Universiade and the 2019 East Asian Youth Games in the city of Taichung. "Chinese Taipei" is a deliberately ambiguous name used as the designation for Taiwan or the Republic of China (ROC), which was agreed under the Nagoya Resolution, whereby the ROC and the People's Republic of China (PRC) recognize each other in activities under the International Olympic Committee.